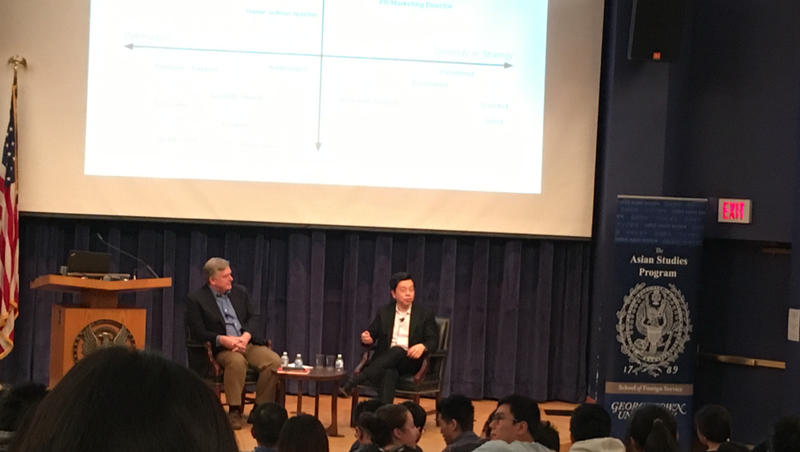 At an event hosted on November 17 by Georgetown University’s Initiative for U.S.-China Dialogue on Global Issues, Taiwanese venture capitalist and former Google executive Dr. Kai-Fu Lee explained the development of artificial intelligence (AI) and how he expects it to affect the economy of tomorrow. Lee focused on advancements in a type of AI called deep learning, which is a computer’s ability to sort through large amounts of data to make conclusions. Lee noted that, throughout the past two decades, four waves of AI deep learning technologies have emerged. The first wave originated in 1998 with internet AI, used by search engines like Google and social networks like Facebook to determine what content users are interested in seeing more of. The second wave of AI originated in 2004 with the advent of business AI programs, which enable banks and insurance firms to sort through data to suggest policies or investment funds to their clients. Lee also discussed apps that his firm, Sinovation Ventures, has invested in. The apps scan people’s phone contacts, apps, model number, and even battery percentage to assess their creditworthiness for loans, which have a 3 percent default rate through the app. The third wave of AI technology began in 2011 with perception AI, which connects the physical world with the digital world, consisting of personal assistants like Alexa and facial recognition systems. Lee cited cameras China has installed at stadiums during concerts that were programmed to look for certain criminals; the cameras correctly identified 30 criminals who were then arrested. However, the cameras also incorrectly identified about 70 individuals who then faced no punishment from the police, Lee said. Lee spoke of the need to find a balance between privacy and convenience with AI and big data, exploring the idea of “digital nobs” set on a scale of privacy and convenience where it would determine how much data sharing a user allowed. Lee also spoke of the challenge of balancing privacy with public good, noting that the U.S. is missing out on much needed data on cancer that AI could help analyze due to patient privacy laws. Thus, allowing more flexible data sharing could lead to advances in medical research, Lee believes. Lee described the fourth wave as autonomous AI, such as industrial robots and self-driving cars. This new wave of AI has revolutionary implications: it could make production more efficient, car transportation safer, and driving obsolete. Lee pointed out that autonomous AI is the only type of AI development that still requires expert researchers, rather than skilled programmers, to develop. Lee believes that AI will make human tasks much more efficient and lead to job displacement, especially in industries that do not require creativity or compassion, but he acknowledged that humans still have free will and are the ones that create AI, dismissing fears it will make humans obsolete. Lee asserted that there is a rising need for personal service jobs, like nurses and elder care aids that AI cannot replace. But, it can help humans optimize these jobs by using data as a tool. Lee explained that those who work in low-compassion, low-creativity jobs (like trucking) will likely gravitate towards these jobs but will be unable to do the job of programming the AI or will not easily gravitate to high-skilled jobs like scientists or mergers and acquisitions specialists that use AI as a tool. This same class of workers also lacks inter-sectoral mobility because specialized positions like CEOs and criminal defense attorneys require both compassion and creativity. When asked by Professor Dennis Wilder, a former National Security Council director for China during the second Bush administration, about AI’s effect on job displacement for blue-collar workers in both China and the U.S., where most job gains due to new technologies go to the coasts, Lee referenced different models. Lee believes that in China, there will likely be more state intervention and government support to those displaced by finding new employment opportunities through state-owned enterprises. In the U.S., on the other hand, the private sector must invest more in retraining employees because the rising government deficit reduces the likelihood of a large public sector response. Lee spoke favorably of an idea proposed by Senator Mark Warner (D-VA) to provide corporate tax rebates for job training, as the tax code currently allows for research and development expenditures. However, Lee was worried that many developing countries will be unable to grow by outsourcing impersonal services, as these tasks will become automated, noting that these countries will likely have to send their brightest students abroad to universities in the West to learn AI skills, develop their own data sets, and create their own personal services jobs. Ultimately, Lee was optimistic that the U.S. and China can work together to solve the challenges presented by AI, noting that AI development should “not be viewed as zero-sum game.” Lee concluded by saying that AI will lead us into “an era of human enlightenment” with reduced work hours by “liberating humanity from routine tasks” and allowing us more time to focus on human relations. AI may present the promise of creating the jobs of tomorrow, many of which we cannot even imagine today.